Gluten intolerance is no longer a fringe medical concept. Researchers are fully aware there is a very big problem with modern wheat cultivation. Wheat is far from being a health food. It makes you fat, causes gas and makes your intestinal tract your enemy, or rather vice-versa. High-yielding and now genetically modified varieties of wheat are making this one cereal grain you'll probably want to axe from your food list. 233 consumer and farmer groups in 26 countries have joined the “Definitive Global Rejection of GM Wheat” statement to stop the commercialization of genetically modified (GM) wheat and remind the biotechnology corporation Monsanto that genetically modifying this major crop is not acceptable to farmers or consumers. So how–and when–did this ancient grain become such a serious health threat? Author and preventive cardiologist William Davis, MD, says it's when big agriculture stepped in decades ago to develop a higher-yielding crop. Today's “wheat”, he says, isn't even wheat, thanks to some of the most intense crossbreeding efforts ever seen. “The wheat products sold to you today are nothing like the wheat products of our grandmother's age, very different from the wheat of the early 20th Century, and completely transformed from the wheat of the Bible and earlier,” he says. Plant breeders changed wheat in dramatic ways. Once more than four feet tall, modern wheat–the type grown in 99 percent of wheat fields around the world–is now a stocky two-foot-tall plant with an unusually large seed head. Dr. Davis says accomplishing this involved crossing wheat with non-wheat grasses to introduce altogether new genes, using techniques like irradiation of wheat seeds and embryos with chemicals, gamma rays, and high-dose X-rays to induce mutations. 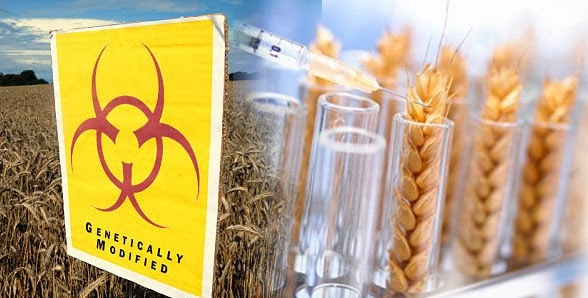 In July 2009, the most hated company in the world Monsanto, announced new research into GM wheat and industry groups kicked their promotion of GM wheat into high gear. “Widespread farmer and consumer resistance defeated GM wheat in 2004 and this global rejection remains strong, as demonstrated by today's statement,” said Lucy Sharratt, Coordinator of the Canadian Biotechnology Action Network. Japan's flour companies are also rejecting GM wheat, echoing consumer opposition. In a statement released today, the Flour Miller's Association of Japan wrote to the No! GMO Campaign indicating its opposition. “Under the present circumstances, with all the doubts about safety and the environment that the consumers in Japan have, including the effect on the human body from GM foods, GM wheat is included among the items that are not acceptable for the Japanese market,” Kadota Masaaki, senior managing director of the Flour Miller's Association wrote to the No! GMO Campaign. Clearfield Wheat, grown on nearly 1 million acres in the Pacific Northwest and sold by BASF Corporation–the world's largest chemical manufacturer–was created in a geneticist's lab by exposing wheat seeds and embryos to the mutation-inducing industrial toxin sodium azide, a substance poisonous to humans and known for exploding when mishandled, says Dr. Davis. This hybridized wheat doesn't survive in the wild, and most farmers rely on toxic chemical fertilizers and pesticides to keep the crops alive. A powerful little chemical in wheat known as ‘wheat germ agglutinin’ (WGA) which is largely responsible for many of wheat's pervasive, and difficult to diagnose, ill effects. Researchers are now discovering that WGA in modern wheat is very different from ancient strains. Not only does WGA throw a monkey wrench into our assumptions about the primary causes of wheat intolerance, but due to the fact that WGA is found in highest concentrations in “whole wheat,” including its supposedly superior sprouted form, it also pulls the rug out from under one of the health food industry’s favorite poster children. The appetite-stimulating properties of modern wheat most likely occurred as an accidental by-product of largely unregulated plant breeding methods, Dr. Davis explains. But he charges that it's impact on inflammatory diseases may have something to do with the fact that, in the past 15 years, it's been showing up in more and more processed foods. Wheat ingredients are now found in candy, Bloody Mary mixes, lunch meats, soy sauce, and even wine coolers. Spelt is an ancient grain that has lately made a comeback in North America, even though it has been popular through the decades in many European countries. Spelt is a non-hybrid distant relative to present day wheat. Spelt's uniqueness is derived from its genetic makeup and nutrition profile. Spelt has high water solubility, so nutrients are easily absorbed by the body making it easy to digest. It is high in protein (significantly higher than wheat), higher in B complex vitamins, and spelt is high in both simple and complex carbohydrates. These complex carbohydrates are an important factor in blood clotting and stimulating the body's immune system. Spelt is a suberb fiber resource. Spelt's nutty flavor doesn't just taste good, it has so many other nutritional benefits that are amazingly good for you! Keep reading to find out more about how spelt's nutrients contribute to lower risk of cardiovascular (heart) disease, type II diabetes, and can lessen occurrences of migraine headaches. Spelt is more difficult to process than modern wheat varieties, making it a little more expensive to purchase. Spelt's husk protects it from pollutants and insects which allows growers to avoid using pesticides, unlike other grains. The husk needs to be mechanically separated from the kernal before milling (this is done after it is thrashed and harvested). The spelt is stored in good, low moisture conditions in order to protect the kernal, retain nutrients, and maintain freshness. Over decades, modern wheat has been drastically changed to be easier to grow and harvest. This in turn increases yields, maintains a high gluten content in the wheat to produce high-volume commercial baked goods. On the other hand, spelt has preserved many of its original traits and continues to remain highly nutritious and full of flavor. And spelt can make fantastic breads and delicious pastries. A note about gluten: Keep in mind that spelt does contain gluten. Gluten is made up of glutenin and gliadin molecules. Gluten provides elasticity to dough, which allows bread to rise. Even though spelt's gluten is more fragile than other wheats, the bread produces fewer air pockets, it is well formed and maintains its flavorful.